Colored text boxes are a great way to draw attention to important information on your site, as well as giving it a custom look by adding color and variety! 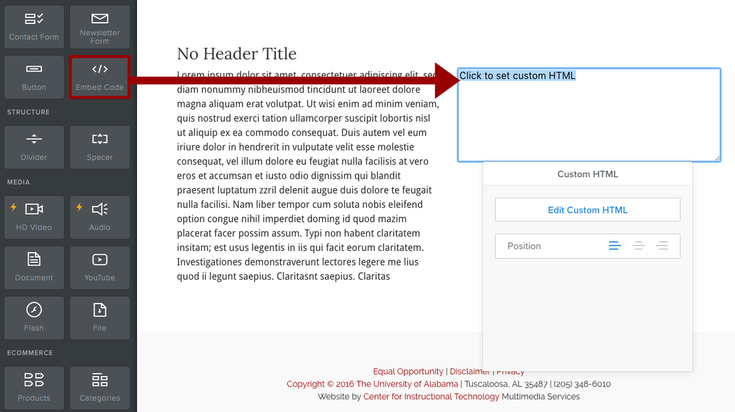 To place a custom colored text box within your Weebly site, start by placing the Embed Code element in the desired location. To apply your custom text, replace "YOUR TEXT HERE" with the desired text. ​The font can be changed by editing the line "font-family:Arial;", replacing "Arial" with the desired font name. Background and font color can be changed by editing the hex code in the line "background-color:#cccccc" and "<b><font color="#990000">" respectively where "cccccc" and "990000" are the 6 digit hex code that corresponds with a certain color. ​​​This is a list of many hex codes for a variety of different colors to mix and match for many possibilities. The shape of the text box can be edited with the "margin", "padding", and "border-radius" lines. "Margin" and "padding" deal with size, while "border-radius" deals with the curvature of the text box. Experiment with these numbers to get the desired effect. The position of the text within the box can be edited by changing the line "<p align=justify style". Changing "justify" to: "left", "center", or "right" will move the text to that location within the box as shown below. ​Replace the line "<a href="http://www.people.ua.edu">" with the web page you would like the text box to link to as shown below.